SOURIAU - SUNBANK Connection Technologies - SOURIAU Central Test Laboratory (CTL) is specialised in environmental testing of connectors, backshells and mid-sized electro-mechanical equipments. SOURIAU - SUNBANK Connection Technologies - SOURIAU Central Test Laboratory is specialised in environmental testing of connectors, backshells and mid-sized electro-mechanical equipments. 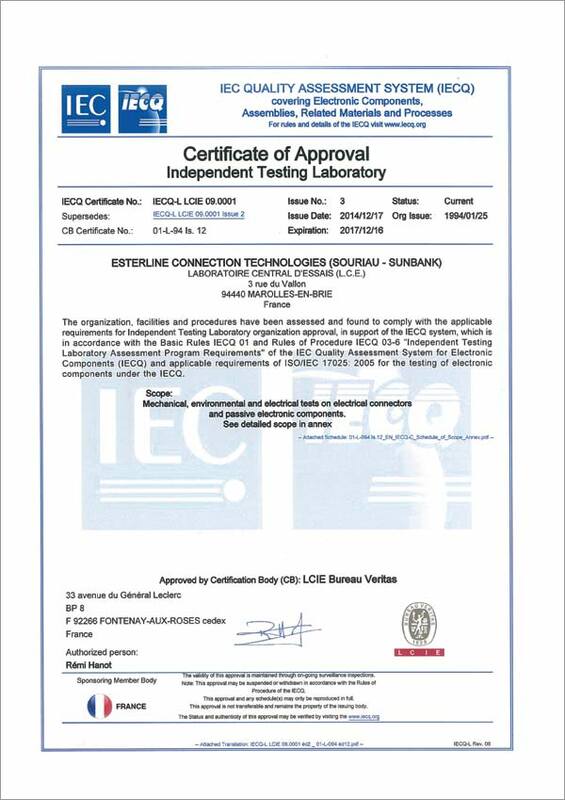 The CTL is certified as an Independent Testing Laboratory by the LCIE Certifying Authority to carry out mechanical, environmental and electrical tests on electrical connectors and passive electronic components (PEMCO). Product qualifications are applied for any use on aeronautic, space, military, industrial and railway markets. The CTL facilities provide a means to simulate all major environmental conditions (mechanical, climatic or electric) for component and equipment evaluation. 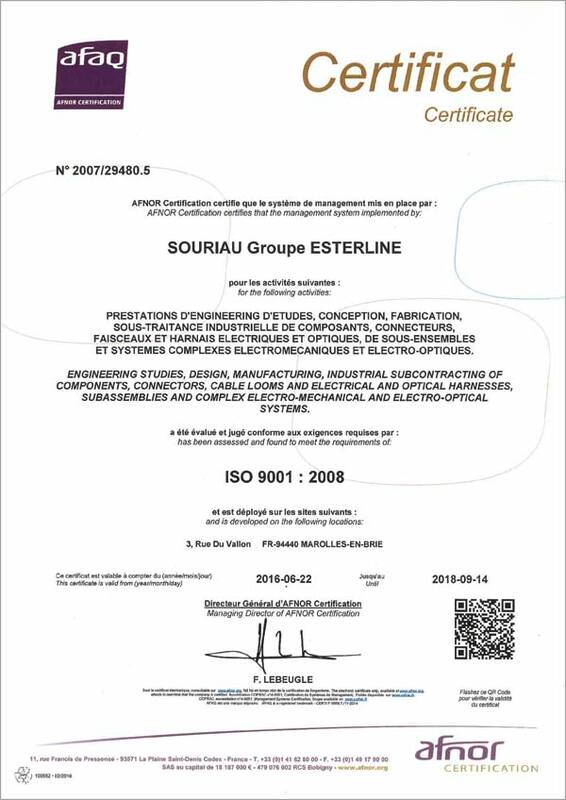 Attested as an Independent Testing Laboratory, the CTL is compliant with the IEC Quality Assessment System and ISO/IEC 17025 : 2005 as well as the ISO 9001 : 2008 requirements. A unique range of tools are used to reproduce the harshest environmental conditions. By the British Standard Institution (BSI) as a laboratory competent to conduct official qualifications and periodic inspections of products BS CECC 75201-002 (JVS Series). By the Bundesamt für Ausrüstung, Informationstechnik und Nutzung der Bundeswehr (BAAINBw) as a laboratory competent to conduct official qualifications and periodic inspections of products VG95328 and VG96912. In compliance with standard MIL-STD-790 by the Defense Logistics Agency (DLA) of the Department of Defense of the United States of America as a laboratory competent to conduct official qualifications and periodic inspections (retention of qualification) of QPL products (Qualified Product List) according to product standards MIL-DTL-38999, MIL-DTL-26482 and MIL-DTL-24308. By the NAVAIR (Naval Air Systems Command) of the United States of America as a laboratory competent to conduct official qualifications and periodic inspections (retention of qualification) of products SAE AS39029 (contacts) and SAE AS85049 (backshells).